Design legend Adrian Newey says he is still troubled by Ayrton Senna's death in one of his cars 19 years ago. Red Bull's Newey was chief designer at Williams when the three-time world champion was killed in a crash during the 1994 San Marino Grand Prix. "What happened that day, what caused the accident, still haunts me to this day," he told BBC Sport. 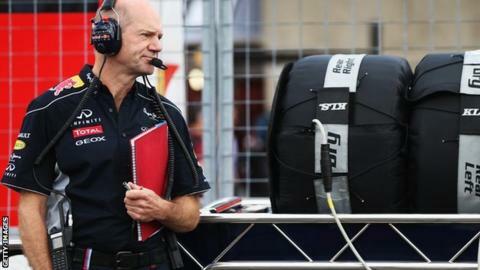 Newey said "no-one will know" whether the accident was caused by driver error or steering-column failure. The Brazilian suffered fatal head injuries in a crash at the 190mph Tamburello corner of the Imola circuit on 1 May 1994. Newey and Patrick Head, Williams technical director at the time, were prosecuted in Italy for manslaughter. The prosecution argued a poorly manufactured modification to the steering column had caused it to fracture and break at the crucial moment. Williams said all the data pointed to a driver error caused by Senna pushing too hard over bad bumps in a corner made more challenging than normal by the handling problems the car was suffering from at the time. After 13 years of on-off trials, the Italian Supreme Court eventually ruled that the accident was caused by steering column failure, for which Head was found responsible. He was not arrested as the case had passed the statute of limitations. "The steering column failure, was it the cause, or did it happen in the accident?" said Newey, speaking in an exclusive interview broadcast on 5 live F1 on Thursday. "There is no doubt it was cracked. Equally, all the data, all the circuit cameras, the on-board camera from Michael Schumacher's car that was following, none of that appears to be consistent with a steering-column failure. "The car oversteered [when the rear tried to spin] initially and Ayrton caught that and only then did it go straight. "But the first thing that happened was oversteer, in much the same way as you will sometimes see on a superspeedway in the States - the car will lose the rear, the driver will correct, and then it will go straight and hit the outside wall, which doesn't appear to be consistent with a steering-column failure." Newey said he was still upset by the knowledge Senna joined Williams to win a fourth title and the car they gave him was not initially up to the job. He was killed in his third race for the team. "There was an aura about him, something that's difficult to describe. He most certainly had a presence," Newey said of Senna. "I guess one of the things that will always haunt me is that he joined Williams because we had managed to build a decent car for the previous three years and he wanted to be in the team he thought built the best car - and unfortunately that '94 car at the start of the season wasn't a good car. "Ayrton's raw talent and determination... he tried to carry that car and make it do things it really wasn't capable of. "And it just seems such a shame and so unfair he was in that position. And then, of course, by the time we did get the car sorted, he wasn't with us any longer." Red Bull's Sebastian Vettel is poised to pass Senna's mark of three titles this season - the German heads into this weekend's Korean Grand Prix with a 60-point lead over his closest rival, Ferrari's Fernando Alonso, with only 150 still available in the remaining six races. But Newey, 54, said it was "completely unfair" to compare drivers he had worked with in his long career. Asked if he felt Vettel, still only 26, could match Schumacher's record of seven titles, Newey said: "Yes, of course it would be fantastic if Sebastian could go on to eclipse Michael's record. But that doesn't necessarily define greatness. "When we talk about the all-time greats, the names of Ayrton Senna, Jim Clark,Jackie Stewart,Emerson Fittipaldi, they come up, as well as Michael of course, [Juan Manuel] Fangio of course, all those names jump to mind. "Some of them have had, in terms of championships, a fraction of the success of Michael. "So there is that intangible thing that defines greatness, which isn't simply results. And I think what Sebastian is well on the way to doing is establishing himself as one of the all-time greats." Listen to 5 live F1's Adrian Newey special.